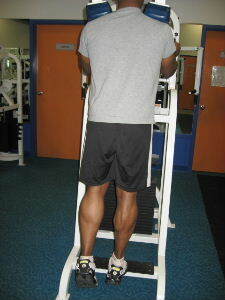 You can perform 1 leg calf raises on a standing calf machine to really isolate each individual calf muscle. 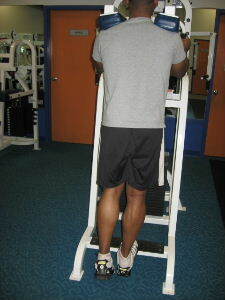 2 leg calf raises are a great way to strengthen your calf muscles, but sometimes one leg pushes harder than the other. When you work one leg at a time, you cannot cheat by pushing more with your stronger leg. In addition to isolating each calf, standing on one leg challenges your core muscles even further and places extra muscle tension on the quads, hamstrings, glutes, and hip stabilizers on the stance side. If you're in a running sport or jumping sport, 1 leg calf raises can really improve your speed and vertical leap. Starting Position: Begin by placing your foot firmly on the step of the machine, and adjust the shoulder pad to a height that is comfortable. Let you heel hang below the level of the step at the beginning. Form: Exhale and raise on to your tip toes. Hold for a brief second at the top of the range of motion, and then slowly lower to the starting position. Personal Trainer Tips: In this version of the calf raise posture is important. Be mindful of the position of your lower back. Don't let your lower back and hips tilt to one side, so keep your pelvis level. Move in a slow and controlled manner, and make sure to use the full range of motion. If you want to improve your sprinting speed or jumping ability, the one leg calf raises is a great exercise to include in your calf workouts. Even if you don't have access to a machine, you can get a benefit by performing this calf exercise on a regular step.